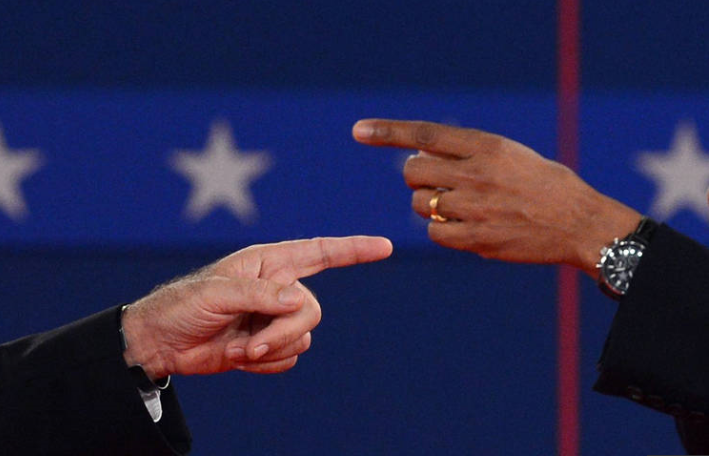 My last post, “The Politics of Distrust” presents the view that the main reason for the divisiveness of today’s politics is “the stubborn torpor of the American economy.” If this is true then the solution is obvious: speed up economic growth! A labor market tight enough to leave employers scouring the land for workers, the best tonic for workers the world has ever known. Mr. Blinder does say that looser purse strings by Congress would help create more demand but it is simply too risky to keep running up our already enormous national debt. Eventually interest rates will return to normal and interest payments on the debt will skyrocket. Raising the federal minimum wage would be an enormous help for wage earners at the bottom. Many states and cities are doing this on their own which is a better way to go because of huge regional differences. Increase the Earned Income Tax Credit, especially for childless workers. A very good way to incentivize work. More Vocational Training and Apprenticeships. Strengthening community colleges and career education in high schools would go a long way to accomplish this. Provide quality pre-K education for families who can’t afford it. Early childhood education for children from low-income families is another very good idea. The tax code is a national disgrace. The corporate tax may be even more complex, inefficient and unfair than the personal tax. The mantra of tax reformers has always been: broaden the base, lower the rates. Amen! What Mr. Blinder is calling a fairness agenda turns out to be a growth agenda in disguise. I would add a few more items like deregulation to encourage entrepreneurship and business expansion but basically Mr. Blinder has suggested an attractive program for economic growth which should appeal to a broad collection of political interests. My last post, “Why Racism Exists in America,” attempts to explain not only the reason for this huge social problem, but also how to look for a solution. It turns out that the city of Omaha, Nebraska, where I live, is doing exactly this in an amazingly progressive manner. It is well known and widely deplored that children from low-income families perform more poorly in school than children from middle class families. The Learning Community of Douglas and Sarpy Counties was created by the Nebraska Legislature in 2007 to figure out how to close this so-called academic achievement gap in metro Omaha. The LC has recently contracted with the Buffett Early Childhood Institute at the University of Nebraska to implement the Superintendent’s Early Childhood Plan which will employ the latest national research findings to provide intensive preschool for three and four year olds at ten different Elementary School sites around the Omaha area. It turns out that Educare of Omaha has already been doing groundbreaking work in early childhood education for the past decade. 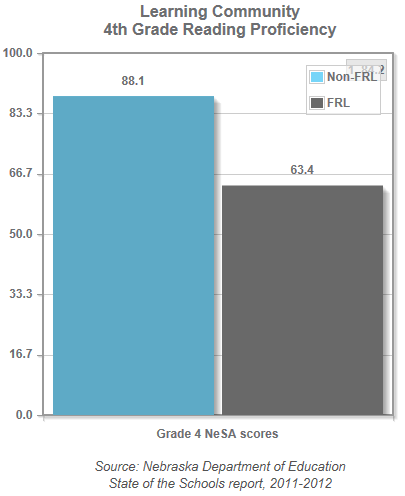 A recent longitudinal study, conducted by the Munroe Meyer Institute (available upon request), has shown that children from low-income families, with two or more years of Educare training, perform well above state proficiency standards in both reading and mathematics all the way through the eighth grade (as far as has been measured to date). As shown in the above chart, just one year in Educare is not enough to achieve this lasting proficiency. It takes two full years to get such a large boost in achievement. This is a hugely significant finding. It shows that early childhood education, if carried out in sufficient depth and for an adequate length of time, will produce long-lasting gains in academic achievement. It is now up to the Learning Community, working with the Buffett Institute, to implement the Superintendent’s Plan, to show that the results achieved by Educare can be scaled up to a broader and more comprehensive level. Omaha’s Metropolitan Area Planning Agency has just released a comprehensive report, “Equitable Growth Profile of the Omaha-Council Bluffs Region,” describing the challenges facing the Omaha area economy in the next 25 years. Racial minorities currently make up 21% of the area’s population, up from 9% in 1980. Under current trends minorities will comprise 39% of the population by 2040. Minorities are less likely than whites to have high school degrees, associate degrees, or four-year college degrees. The education gap contributes to a skills gap which in turn contributes to a jobs and income gap. As shown above, black unemployment at 12.2% (in March 2014) is much higher than the unemployment rate for any other racial group. 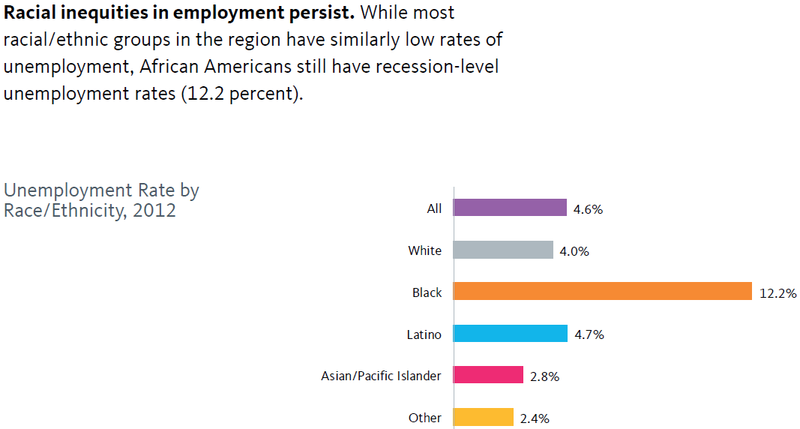 MAPA has several suggestions for improving job prospects for blacks such as more and better job training, better public transit, and helping minority owned businesses. It also suggests building “cradle to career” pipelines for underprivileged youths. This last suggestion is precisely what the Omaha area Learning Community is focused on. As I reported several months ago, the superintendents of the 11 school districts in the Learning Community have approved a comprehensive plan for Early Childhood Education whose purpose is to make sure that children from low-income families are well prepared to succeed in school. It will be funded by a ½ cent levy approved by the Learning Community Coordinating Council. These same 11 superintendents are highly supportive of the overall mission of the LC to close the academic achievement gap between low-income students and middle class students. They have recently submitted a report to the Education Committee of the Nebraska Legislature suggesting ways to make the LC even more effective than it is already. Achieving improved educational outcomes for minorities has been called America’s big new civil rights challenge of the 21st century. Omaha is making significant strides in addressing this problem thanks to a huge communitywide effort by many different organizations including the Learning Community. The Learning Community Is Not a “Failed Experiment”! The “Learning Community” represents an experiment being conducted in Omaha, Nebraska, where I live, to determine whether the entire metro area can work together to close, or at least narrow, the academic achievement gap between low-income and middle class students. The extent of the problem is clearly demonstrated by the chart below which shows that starting in elementary school reading proficiency is lower for low-income students and this “gap” continues to get worse in middle school and then gets much worse in high school. 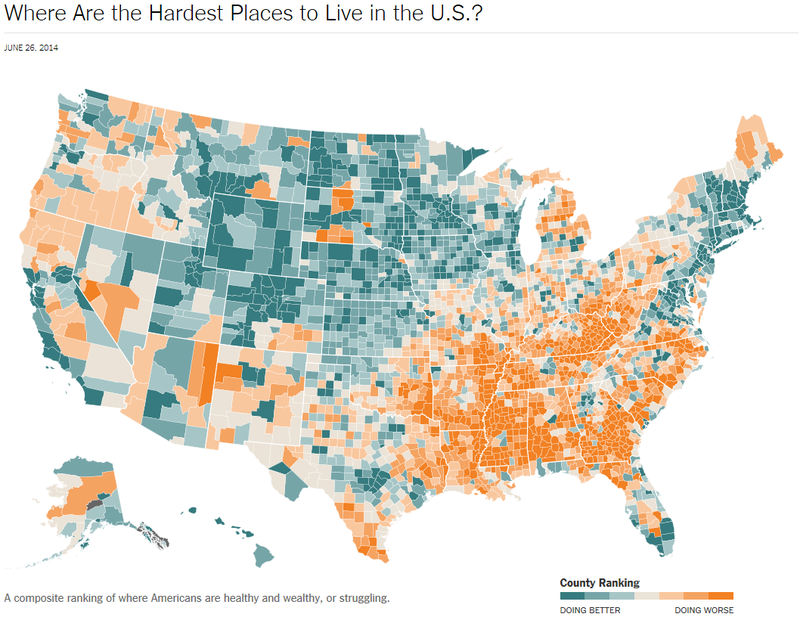 Not surprisingly, the same problem exists throughout the entire state of Nebraska to only a slightly lesser degree. Now, six years after the establishment of the Learning Community by the Nebraska Legislature, the superintendents of the 11 LC school districts are putting together a comprehensive report on its operation. There have been repeated complaints about the fairness of the LC’s common property tax levy because it has created many more losers than winners among the 11 districts. There have also been questions raised about the costs and efficacy of the “open enrollment” facet of the plan whereby low-income students can transfer to an adjoining district and receive free transportation. It is useful for the superintendents to address these issues in an organized manner. What will be difficult, of course, is for all eleven school boards to come together in agreement on a final report to the legislature. The Omaha World Herald reports today on how that process is going. The superintendents are actually very positive about a new program for early childhood education as well as other elementary learning center programs housed primarily in North and South Omaha. One superintendent has suggested to his Board that they might want to tell lawmakers that the Learning Community should be declared a “failed experiment” and dissolved. But given the enormity of the achievement gap, as discussed above, it is unlikely that a majority of the K-12 educational leadership in Omaha will support such a negative recommendation. The U.S. must figure out how to do a better job of educating children from low-income families and Omaha’s Learning Community is making significant progress in addressing this very critical national problem. My last two posts have dealt with the racial unrest in Ferguson MO and how American society should respond to the basic underlying causes. In particular Omaha NE where I live is in the process of setting up a large scale pilot project in early childhood education to better prepare children from low-income families to succeed in school. 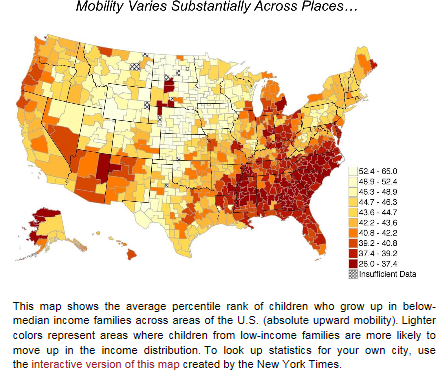 The Equality of Opportunity Project at Harvard University has published a chart (above) showing the degree of upward mobility for children born into low-income families in different parts of the country. Omaha ranks much higher than St. Louis but not as high as it could. The current unemployment rate in Omaha is 3.8% which essentially represents full employment. This means that there are plenty of jobs available for well qualified applicants. However the above chart shows the extent of the achievement gap in metro Omaha between middle class children and children living in poverty. It is already substantial for fourth grade reading proficiency and becomes much worse in the higher grades. Conclusion: in Omaha NE the root cause of lack of economic opportunity for racial minorities living in poverty is not the availability of jobs but the inadequate educational achievement to hold a good job. Omaha is a prosperous community in a prosperous state. But it could do a better job of educating children living in poverty. Can Omaha Avoid Having Its Own “Ferguson”? As racial tensions begin to ease in Ferguson MO, it is natural to inquire about the root causes of this turmoil and how to avoid future recurrences. Of course, police brutality and public distrust were the triggering events and need to be thoroughly investigated by the proper authorities. But the problem goes deeper than this. 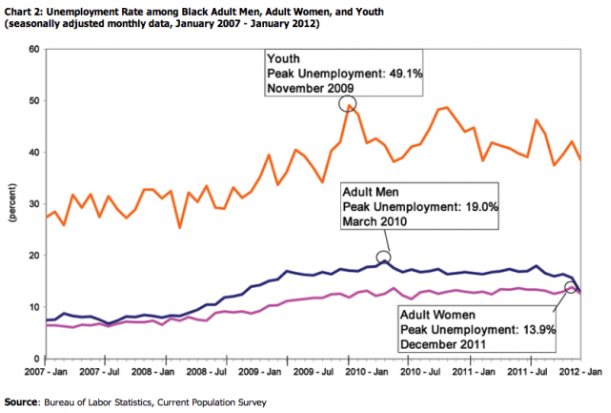 The above chart from Think Progress demonstrates the very high unemployment rate among black teenagers. Is it surprising that idle teenagers get into trouble? Omaha NE, where I live, is not immune to these problems. In 2011 Nebraska had the worst black homicide rate in the nation at 34.4 per 100,000 population, just ahead of Missouri with a rate of 33.4. Black unemployment in Omaha is estimated to be 20% compared with Omaha’s overall unemployment rate of 3.8%. The problem goes still deeper yet. To be employable, black youths need to become educated, i.e. to stay in school and remain on track to graduate. This, in turn, means that they need to succeed in school from the very beginning, for example, by being proficient in reading at the end of third grade. My last post, “Responsibility Goes Along With the “Good Life,” describes steps that are now getting under way in Omaha to turn around this whole vicious downward spiral of destructive black teenage behavior. The Buffett Early Childhood Institute has put together a long range plan to work with children in poverty from birth to age eight to make sure that they are prepared to succeed in school. It is funded by an annual property tax levy of $5 per $100,000 of assessed valuation throughout the two county metropolitan Omaha area. With such a local funding source, the program will inevitably receive much public attention. Nebraska is aware that not all of its residents share in the “Good Life” and is making a conscious effort to find its own solution for a very serious national problem. The New York Times recently compiled a map rating each of the 3,135 counties in the U.S. according to the following six factors: educational attainment, median household income, unemployment rate, disability rate, life expectancy and obesity. As can be seen (below) the whole state of Nebraska (motto: the Good Life) comes out very well in this rating scheme. On the other hand, Omaha has the highest black child poverty rate in the country at 59.4% (Omaha World Herald (4/15/2007)). Partly for this reason the Nebraska Legislature established the Learning Community of Douglas and Sarpy Counties in 2008 whose purpose is to close the academic achievement gap between middle class and low-income students in the Omaha metro area. Just a few days ago the Learning Community Coordinating Council approved an early childhood education plan developed by the Superintendents of the 11 Omaha area school districts to help children in poverty in the metro area. It will cost about $2.5 million per year and will fund 29.5 full-time equivalent positions. The plan will be managed by the newly established Buffett Early Childhood Institute in Omaha. The increase in the property tax throughout the two county area to support this program will amount to $5 per year for the owner of a $100,000 house. It is quite appropriate for an overall wealthy community like Omaha in a very well off state like Nebraska to pitch in, in this way, to help out its less fortunate residents. It represents an example of how state and local governments can and should step in and take more responsibility for addressing their own problems without help from the federal government which is broke and needs to cut back on what it does. If the Early Childhood Education plan lives up to its high expectations (as I believe it will), it is likely to receive much national attention and will become a model for other parts of the country. Nebraskans should be proud of supporting such a forward looking initiative!